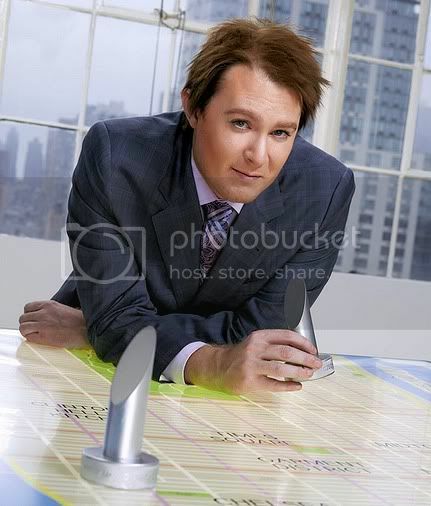 Clay Aiken joins 2012 Celebrity Apprentice cast. From the moment Donald Trump officially presented the new Celebrity Apprentice cast on Wednesday's Today Show, the 18 candidates have whirled through a continuous, sometimes crazy, merry-go-round of multimedia promos. Through individual videos, NBC provided a brief intro to each candidate. Mashable Entertainment picked up the videos and tabbed the line-up as the Most Connected Cast Yet. To stay connected to Clay and read the latest about Celebrity Apprentice from his perspective, follow the singer at Twitter and Facebook. The series, which debuts on NBC on Feb. 19, is also being advertised through interviews on every show and site imaginable. The screen cap below links to a TV Guide interview of Clay Aiken and Lisa Lampanelli. 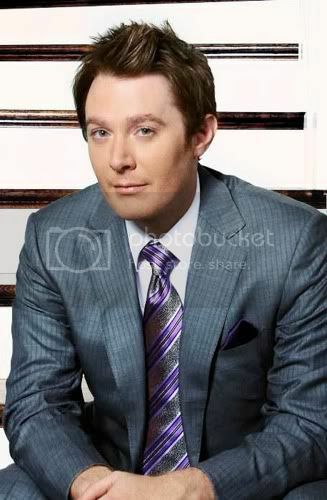 Clay Aiken, Lisa Lampanelli in TV Guide interview. Click on screen cap to link to video. Clay Aiken, Aubrey O’Day, George Takei, and Real Housewives of New Jersey star Teresa Giudice will be vying for the title while competing for each of their charities. "Being in front of [Donald] Trump is more intimidating than [being in front of Simon Cowell]. That’s because you realize his success is real outside of TV. Whereas with Cowell, I don’t deny him his value – but singing is not his expertise," Clay, who once was runner-up on American Idol, told Today. Clickable Celebrity Apprentice graphic by Fountaindawg. An excellent introductory story running in the International Business Times answers the question Who Are Clay Aiken, Teresa Giudice and the Other Contestants? Brief bios of the 2012 line-up are included. Not to be missed is The Dead Bolt interview: Adam Carolla Surprised by Clay Aiken. The Inclusion Project received excellent publicity in the CBS story: Clay Aiken's National Inclusion Project To Benefit from His Celebrity Apprentice Appearance. ... the rumor is Clay Aiken is the one to watch this season. Hollyscoop talked to several cast members Wednesday, and it seems everybody is raving about Aiken. The photo above links to the Root Music Player on Clay's Facebook page. Once there, you can listen to "Unchained Melody," "Bring Back My Love," "Suspicious Minds," "Misty," "The Way," and "Invisible." We try to focus on everyone, who has something positive going on in their lives, and we also hit hard news. [snip] But it is very rare that a celebrity has such a huge following, and yet their fans are so genuinely gracious, kind and supportive, generous in spirit and all around awesome! Clay Aiken has such fans. 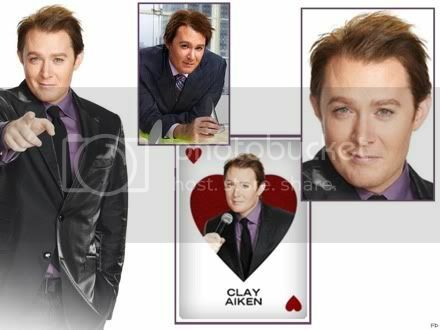 But it’s great when he picks someone as charismatic, talented and genuinely kind as Clay Aiken to appear as a contestant on his highly-rated series "Celebrity Apprentice," which thanks to Clay’s wonderful fans will be even higher rated than any previous season. Thanks, Aiken fans, for showing Highlight Hollywood and the world, that you back the right guy, and that you all have as much class he Clay does! You do him proud! Set your Tivo and other recording devices for 9 pm ET Feb. 19-May 27. If this week's publicity, Twitter and Facebook social networking activities are any indication, the Clay Nation and the National Inclusion Project are in for one heckuva ride this spring. Hold onto your hat, and have an awesome week, all! What a great blog this is full of information and photos about all the CApp contestants! Thanks! It's great to have everything conveniently linked here! Thanks for another excellent blog, Caro. :) Makes it easy to view all the clips again...and again.. and again! BTW, I'm hoping that you could add a link to Clay's twitter account so that people could follow his tweets about Celebrity Apprentice. Thanks! Thanks for all U do for Us!! Enjoy every blog! Love having Clay in sight and fun to have him on tv soon!! D.in Wi. Another great blog...as usual!!! Loved it and love having the info all together. Thank you for doing this! Thanks for all you do to keep us informed. I don't follow Face Book or Twitter so you help to keep me up to date here!! I do believe we are on the way to a wonderful year filled with Clay....let the fun begin!! I am so anxious for the world to see in Clay what we have seem all along!! "It's About Damn Time"!!! Thanks for the great blog. It's been so fun reading all the great press. Go Clay! Thanks for all the links, Caro. The top picture of Clay matches your "Carolina Blue" very well. Add me to the list of soooooooooooo excited fans awaiting the Feb 12 debut! Oh My Goodness, Caro....You did it again! What a awesome blog. Thank You for all the links, the wonderful photos. just everything!!! "Add me to the list of soooooooooooo excited fans awaiting the Feb 12 debut!" also. Hi, Caro! Love your blog! I got even more excited about Celebrity Apprentice as I was reading all the info. and clicking on the links. The interviews of Clay are great, and I am very impressed with what Highlight Hollywood had to say about him and his fans. Can't wait until February 12! A very special item at the NIP Gala 2010! The Naked Chef turns 20! I'm losing it, and learning to live a healthy life! No Damn Three Putts: A golf blog with balls.